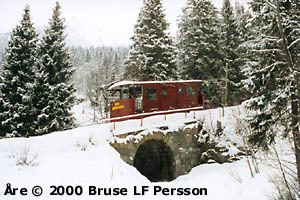 When the railroad came to Åre in 1882, the first tourists came with it. They were called "luftgäster" ("air guests") because the fresh air was what brought them to Åre. During the summer, tourists would hike to places like the summit of the mountain called Åreskutan. That hike involved a thousand-meter overall climb and took about three hours. In the winter, tourists would ride sleds, for example. Nowadays, it's the fine ski slopes that attract tourists. The funicular's lower station is called "Torget," and lies at Åres torg (Åre square), attached to the railroad station. In the railroad station, you can buy a ski lift pass that is also valid for the funicular, or you can buy a round-trip ticket on the funicular for SEK 40. You can also rent a sled to ride down Kälkspåret ("the sled trail"), which runs along the funicular's path from Fjällgården all the way down to Åres torg. At the ends of each funicular car, there are shelves where the sleds can be placed during the ride up. The car is in the station, and I board. With its open platforms, it reminds me quite a bit of a tram. The conductor turns a key in a lock in the wall of the station building, causing a bell to ring once. The conductor at the upper station rings an answering signal in the same way; then there is a long ring and the cars start automatically. We ride under European highway E14, which runs between Östersund and Trondheim. After a while, we arrive at the middle station, Tottvägen, where the two cars meet. We slow down a bit, then the two cars make a perfect stop opposite each other. There is a short stop here for boarding and alighting. The conductor takes this opportunity to plan the evening's activities, which determines the length of the stop. The planning completed, the conductor of the upbound car turns a key in a lock on the platform, and the cars start up again. We pass over a tunnel of mortared stone which carries Rahmsvägen. Then we pass over Fjällgårdsvägen, and the line bends a little to the left and becomes steeper. Just before we arrive at Fjällgården, we pass under a concrete bridge which carries Fjällgårdsvägen. The car brakes and stops smoothly at the upper station, Fjällgården. The journey has taken about eight to ten minutes. There is a departure every twenty minutes, more often when needed. Here on Östra Platån (the East Plateau) we are in the center of the lift network, and the fun can begin for those who enjoy skiing. But not me; I'm to meet Bengt Larsson, who is to show me around. This all started with the engineer Carl-Olof Rahm (1870-1946), who came up with the idea of turning Åre into a winter tourist destination, a "Swedish Davos." The extensive plans for Åre as a tourist destination were drawn up in 1906, and the funicular was an important part of the "Åre project," as it was called. Initially, the intention was for the funicular to go all the way up to Mörvikshummeln, and Rahm planned for it to eventually go all the way up to the summit of Åreskutan. Unfortunately, these plans were never realized for financial reasons. The funicular was cut in half and its upper station placed on Östra Platån instead. The second stage of the plans would not be realized until 1953, but a cable tramway to Mörvikshummeln was built instead. Construction of the funicular began in 1908, and was rather difficult given the muddy, sloping terrain. The line is 790 meters long, with a height difference of 158 meters from bottom to top. The gauge is 1.09 meters (about 3'7"). The funicular includes three stations. 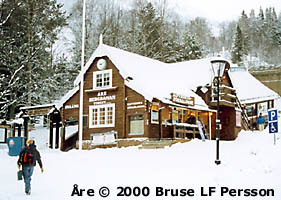 The lower station, Torget, is at Åres torg, 398 meters above sea level. The upper station is at Fjällgården, 556 meters above sea level. 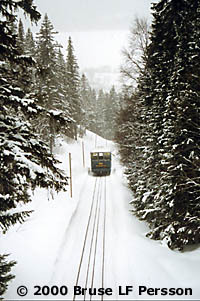 Like most funiculars, the line includes a middle station where the two cars meet, with two tracks; this one is called Tottvägen, 470 meters above sea level. Architect Otto Sigfrid Cronstedt designed all the buildings that belong to the funicular. The lower station, Torget, was built with horizontal tarred timber and decorated with Norse motifs. Fjällgården, the upper station, was built in the same style, and includes offices and the machine room in its basement. The funicular was opened on 7 March 1910, and the "air guests" could then enjoy sled rides from the funicular's upper station down to Åre. And ninety years later, you still can! The two cars still have their original undercarriages from 1910, but a rebuild in 1958 gave them new bodies of sheet metal rather than wood. ASJ of Linköping rebuilt the cars, giving them side doors for greater capacity as well. Previously, the cars were boarded through small side doors to each end platform, as on a tram. After this rebuild, the cars could handle forty passengers each. In 1976 their capacity was increased again by removing some seats, leaving only eight seats in each car and increasing car capacity to sixty persons. The cars are 9.15 meters long, 2.5 meters wide and 2.85 meters high (measured from top of rail). They weigh 7.8 metric tons and can carry 4.8 metric tons, giving a total weight of 12.6 metric tons. Car 1 is blue, and car 2 is red. The line itself was also rebuilt in 1958. Von Roll, who had built the line originally in 1908, was hired for the rebuild as well. The cable was swapped for a thicker one, 28 mm in diameter, consisting of 114 wires. The great wheel in the machine room had to be turned down in a lathe, decreasing its diameter to fit the thicker cable. A new 54 kW DC motor transfers its power to the line via a worm gear. Most everything in the machine room is original 1910 equipment. The cars run at 1.5 m/s, which is shown on a speedometer in the control room at the upper station. The guide wheels that ran between the rails along the whole line, carrying the cable, have been swapped for yellow plastic guide balls. This decreases maintenance costs. In recent years, the upper station's waiting room has been considerably altered. Among other measures, the roof has been taken off, and the entire waiting room remodeled, making it a popular place for breaks, with its scent of hot cocoa. The ground around the upper station has been dug up and the foundation recast. A supporting wall has been built around the upper station to resist the pressure of the ground. Since 1976, the line has been rebuilt and become steeper. Unfortunately, the line is built on soil that is mostly clay, requiring the tracks to be realigned and the curves wedged for support every year when the frost in the ground breaks up. There are plans to install frost protection for the entire line. From the start of service in 1910, SJ (formerly the Swedish State Railways, now a state-owned corporation) has operated the line. Ten people were required to operate the funicular and the few lifts that existed then. Careful statistics were kept in a book for each run: number of passengers, how many were paying passengers and how many were staff traveling the line. Until 1967, the line was manned by an engine man and two conductors, one on each car. A simple but ingenious bell system was used. Along the entire line ran (and still runs) an electrical signal cable on poles at a height of about 2.5 meters. With a staff that was grounded to the car, the conductor of the first car struck the signal cable, causing a bell to sound in the engine room. When the other car was ready, its conductor signaled in the same way. When the engine man had received two signals, he started the cars. From the engine room, the engine man could only see the upper station and the upper fourth of the line, after which it curves. This means that the engine man cannot see the two cars meet at the middle station, Tottvägen. To the right of the controller, a vertical chain is installed that runs up and down. On each side of the chain is a marker -- one numbered 1, the other 2, symbolizing the two cars. The chain is coupled to the line mechanically, and as the cars travel up and down, the markers travel along the chain to indicate their position. In other words, a mechanized track diagram! The engine man can see when the cars are exactly opposite one another and apply the brakes. This simple but ingenious device was extremely exact -- to about a decimeter! Nowadays, this is all handled electronically. Today, there are five year-round employees for the funicular and for the fifteen ski lifts in the four skiing areas. For example, my guide, Bengt Larsson, is part of the Ski Patrol; they have medical training, and blast away avalanches when needed. SJS (Svenska Järnvägsmännens Semesterhemsförening -- the Swedish Railwaymen's Vacation Home Association) took over the funicular and Fjällgården in 1950. Since then, the funicular and the lifts have had three different owners: Åreliftarna, Åre AB and now Sälen Stjärnan, which also owns the lifts in Sälen, Vemdalen and Lindvallen, which are other Swedish ski resorts. Fjällgården is still owned by SJS, which is an incorporated association with about 18,000 members, all of them railroad employees. The funicular is extremely safe, equipped as it is with seven separate braking systems -- mechanical, electrical and manual. Twenty meters before each end station and at the middle station, there are magnetic contacts that sense when the cars arrive. The first magnetic contact slows the car down; the next one brakes it to a stop. If the magnetic contacts should fail to work, there are four trigger switches that brake the cars in the same way. If the cars should get too far in spite of this, there is a long lever that the cars strike, cutting all power to the line. If the cable that connects the cars should go slack, the cars are emergency braked. This means that when the cable is tensioned, the cars' own brakes are released. On each car's platforms, there are manual hand brakes that the conductor can stop the car with, similar to those found on older trams. In the motor, there are sling weights that brake the cars if the speed is too high. These are original 1910 equipment. The signal cable that runs along the line is now used as an emergency brake. The staff that conductors used to signal with is now grounded, and if the signal cable is struck with the staff, the main traction current is grounded there, and the line's machinery is halted. 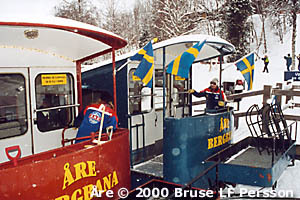 The funicular's 90th anniversary was celebrated on 7 March 2000 with a big party. The activities included free sled rides and fireworks. I've already put 7 March 2010, the line's 100th anniversary, in my calendar! See you there! Bengt Larsson, who showed me around and gave me coffee, and the conductors I met, Anki from Gothenburg and Karita from Kiruna, who I had such pleasant conversations with. All photographs taken in 29 januari 2000. Thanks to: Bengt Larsson, who showed me around and gave me coffee, and the conductors I met, Anki from Gothenburg and Karita from Kiruna, who I had such pleasant conversations with, at Å.R.E. AB.